Hieronder treft u een voorbeeld Sollicitatiebrief Engels 2. Deze brief kunt u als opzetje gebruiken voor uw eigen sollicitatie voor de betreffende functie. Zorg ervoor dat de brief aansluit op het profiel, waarbij u op enthousiaste wijze een korte omschrijving geeft van uw profiel. Hope you are doing good. I am exploring an opportunity within your esteemed organization. Presently, I am working as a consultant in ____(company), providing technical solutions for various companies. We support various aspects of the technical branches across the globe addressing their technical assessment. Primary role is to sale the products and keep in contact with the diverse group of customers worldwide. 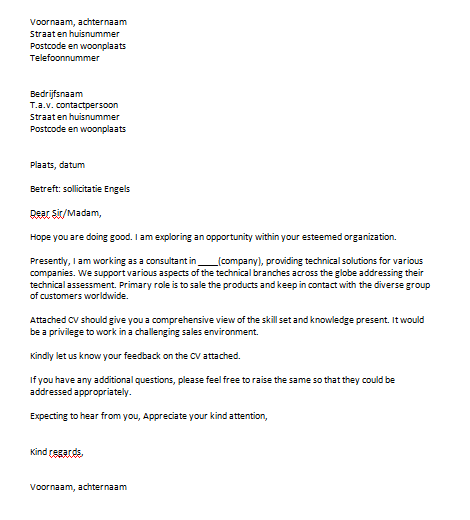 Attached CV should give you a comprehensive view of the skill set and knowledge present. It would be a privilege to work in a challenging sales environment. Kindly let us know your feedback on the CV attached. If you have any additional questions, please feel free to raise the same so that they could be addressed appropriately. Differentiation of the school, subjects, etc. Jan04-jan08, Company name, complete company name of the company you have worked. Official name of the function you had at this company. Describe the skills and responsibilities at you job. Make sure your resume suits the vacancy. In case you are applying for a technical function you will give a good description of the technical responsibilities you had in your past. feb08-jan14, Company name, complete company name of the company you have worked. download sollicitatiebrief engels 2 in Word.